Do You Really Think This Was a ROCKET??? 2017 has been another exciting year for UFO activity and news. 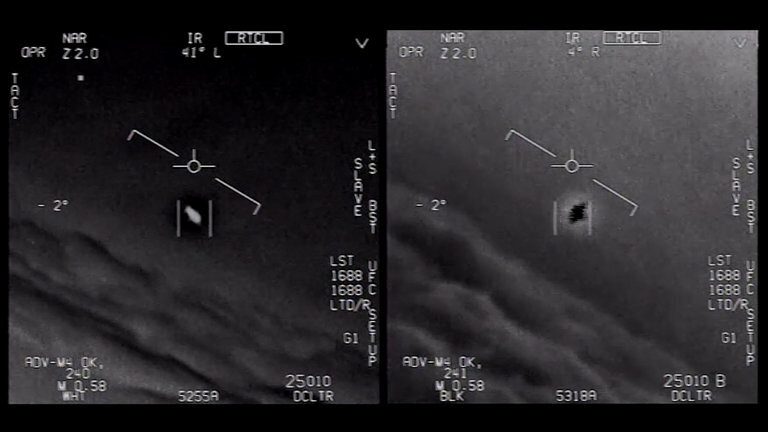 In the first half, Alejandro Rojas, UFO expert and researcher, joined George Knapp to discuss UFO activity from the last 12 months, as well as the recent startling announcementabout the Pentagon's program to study UFOs, which ran from 2007 to 2012. This past year has been a chance to connect some of the dots in the UFO mystery, said Rojas, whose organization Open Minds, named Tom DeLonge as the "UFO researcher of the year." An associate of DeLonge's at his new To the Stars Academy, Christopher Mellon, called in during the first hour. Mellon had been an insider on classified projects and was instrumental in the just-published New York Times coverage of the Pentagon's UFO program. One of the fascinating revelations about the Pentagon's program is that they collected metals and other materials recovered from unidentified aerial phenomena. The study of these materials has the potential to advance technologies or develop new ones, Rojas commented. In looking back at 2017, he cited some of the more notable stories: the Chilean UFO footage (which turned out to be an ordinary plane), the UK government's release of UFO files, the actor Kurt Russell's admission that he saw the Phoenix Lights while he was piloting a plane, and an update on the mysterious WOW signal. In 1955, the CIA established a clandestine base of operations in the Nevada desert called Area 51 with a mission to protect the US from a growing communist threat. Special projects there were shrouded in mystery, and before flying saucers were rumored, the world’s most famous spy plane, the U-2, was fueling rumors and legends for decades. In the latter half, author and Area 51 veteran TD Barnes shared some of his first-hand stories, as well as formerly classified info about the secret technology at the base. He played an important part in taking apart and putting back together the first Soviet MiG plane ever acquired by the US. During this Cold War era, the U-2 program was more highly classified than the atomic bomb, he noted. There was intense security for employees such as himself-- he often did not know what co-workers were working on, and was not allowed to tell his wife the specific nature of his work until 2009. 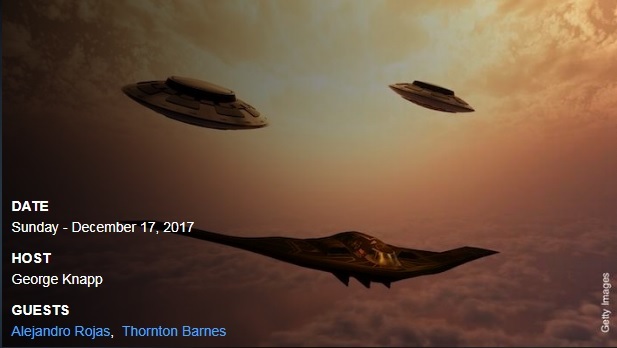 Barnes worked on the A-12, the military's first stealth plane, and revealed that a variety of concept planes were flight tested out of Area 51 like the unusually shaped Aurora, though these vehicles typically did not become operational. As to current activity at the base, he suggested that craft now were mostly unmanned and subsonic. What is so Special About Sirius, the Dog Star? Our readers are plenty interested in unidentified flying objects. We know that from the huge response to our front-page Sunday article(published online just after noon on Saturday) revealing a secret Pentagon program to investigate U.F.O.s. The piece, by the Pentagon correspondent Helene Cooper, the author Leslie Kean and myself — a contributor to The Times after a 45-year staff career — has dominated the most emailed and most viewed lists since. The journey began two and a half months ago with a tip to Leslie, who has long reported on U.F.O.s and published a 2010 New York Times best seller, “UFOs: Generals, Pilots and Government Officials Go on the Record.” At a confidential meeting Oct. 4 in a Pentagon City hotel with several present and former intelligence officials and a defense contractor, she met Luis Elizondo, the director of a Pentagon program she had never heard of: the Advanced Aerospace Threat Identification Program. She learned it was a secret effort, funded at the initiative of the then Senate majority leader, Harry Reid, starting in 2007, to investigate aerial threats including what the military preferred to call “unidentified aerial phenomena” or just “objects.” This was big news because the United States military had announced as far back as 1969 that U.F.O.s were not worth studying. Leslie also learned that Mr. Elizondo had just resigned to protest what he characterized as excessive secrecy and internal opposition — the reason for the meeting. She spent hours with him reviewing unclassified documents, for the $22 million program operated largely “in the white” (that is, not under special restricted access), but hidden in the huge defense budget, with only parts of it classified. A few days later Mr. Elizondo and others there — including Harold E. Puthoff, an engineer who has conducted research on extrasensory perception for the C.I.A. and later worked as a contractor on the program, and Christopher K. Mellon, a former deputy assistant secretary of defense for intelligence — announced they were joining a new commercial venture, To the Stars Academy of Arts and Science, to raise money for research into U.F.O.s. Leslie wrote it up for the Huffington Post with scant details of the program. He alerted Mark Mazzetti, the investigations editor in the Washington bureau. Leslie and I briefed him in New York on Nov. 7. We assured him there were no anonymous sources; everyone was on the record. After discussions in Washington and New York, Helene joined our team. The Washington bureau chief, Elisabeth Bumiller, would be our editor. On Nov. 17, we three met Mr. Elizondo in a nondescript Washington hotel where he sat with his back to the wall, keeping an eye on the door. Leslie interviewed the aerospace magnate Robert Bigelow, who also confirmed his participation, saying Americans were being held back from serious research into U.F.O.’s by “a juvenile taboo.” And I interviewed a prominent skeptic for perspective. It was important that we not take anything on faith. This field attracts zealots as well as debunkers, and many Americans remain deeply skeptical that the phenomenon exists as popularly portrayed. In draft after draft, we took pains to let the investigation speak for itself, without bias. Helene met with a Pentagon spokesperson on Dec. 8 for a response to the information we had gathered. The answer came swiftly. There had been a program to investigate U.F.O.s, but it ended in 2012 after five years, the Defense Department insisted. Our reporting suggested it continues, largely unfunded, to the present. And that’s what we wrote.